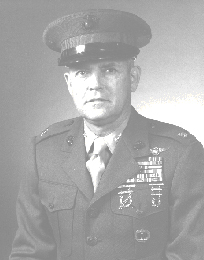 Brigadier General Lloyd W. Smith Jr., retired from the Marine Corps on July 1, 1985. He was awarded the Legion of Merit for exceptionally meritorious conduct in the performance of outstanding service as Director of Intelligence, Headquarters United States Marine Corps from May 1983 through June 1985. He was born on July 28, 1932, in St. Louis, Missouri, and grew up on the mid-west and Washington, D.C. He attended George Washington University and graduated from Doane College, Crete, Nebraska, with a B.S. degree in Political Science in 1954. He also holds an M.A. degree in Public Administration from Auburn (Alabama) University and served in an active Reserve unit as a sergeant until he was commissioned a second lieutenant in May 1954. Upon graduation from the 3d Basic Course at Quantico, Va., in 1954, he was transferred to the 2d Marine Division, Camp Lejeune, N.C., for duty as platoon leader, S-2 and Assistant S-3, 3d Battalion, 2d Marines, until 1956. Transferred to Marine Barracks, San Juan, Puerto Rico, he served as guard officer. He attended flight training at Pensacola, Fla., in June 1958, and upon completion was assigned to HMR (L)-261, New River, Jacksonville, N.C., for duty as a pilot. From November 1959 to December 1963 General Smith served in various units as a pilot Assistant Maintenance Officer, Assistant Air Group S-3, and standardization pilot. During this period, he served a tour in the Western Pacific with Marine Aircraft Group-16, which included duty in the Republic of Vietnam. In December 1963, he was assigned to the Officer Candidates School, Quantico, where he served as the Assistant S-3 until February 1966, when he reported to the Amphibious Warfare School as a student. Upon completion, he transferred to Marine Aircraft Group-36, in Vietnam, where he served until October 1967 as an Air Group S-2, Air Defense Coordinator, Rifle Company Commander, and later, as the Maintenance and Operations Officer for VMO-6. Upon his return to the United States, he was assigned to the Defense Intelligence Agency, Washington, D.C. He was Head of the Operations Group, Air and Missile Section, Chinese Communist Branch. He became Chief of the Section after promotion to lieutenant colonel and left the Agency in August 1970. The following month, General Smith returned to New River for duty with MAG-26. He served as the Group S-1 until February 1971, and then became the first Commanding Officer to attend the Air War College, Montgomery, Alabama, and is a Distinguished Graduate Of the Air War College, class of 1973. General Smith reported overseas in August 1973 and served as the S-4 and S-3 of MAG-36. He was the Executive Officer of PROVMAG-10 during Operation Fly Away in Korea. Upon return to the U.S. in August 1974, he was assigned as an instructor at the U.S. Army War College, Carlisle, Pa. He also served as the senior Marine representative at the War College. He completed all requirements of the course and is a graduate of the Army War College. Ordered to the 2d Marine Aircraft Wing, Cherry Point, N.C., in July 1977, he served as the Commanding Officer, MAG-29 until April 1979, when he was assigned as Air Officer, 2d Marine Division, Camp Lejeune, N.C. During January 1980, he assumed duty as the Chief of Staff, 2d Marine Division. While serving in this capacity he was selected in February 1981 for promotion to brigadier general, he was promoted to that grade on April 1, 1981, and assigned duty as the Assistant Wing Commander, 2d Marine Aircraft Wing, FMF, Atlantic, Marine Corps Air Station, Cherry Point, N.C., on April 16, 1981. He assumed duty as the Director of Intelligence, Headquarters Marine Corps, Washington, D.C., on May 23, 1983. General Smith served in this capacity until his retirement on July 1, 1985. His previous promotions include: first lieutenant, December 1955; captain, January 1959; major, November 1965; lieutenant colonel, July 1969; and colonel, July 1976. His personal decorations and awards include: the Distinguished Flying Cross; Meritorious Service Medal with oak leaf cluster; the Air Medal with Numeral 22; and the Navy Commendation Medal with Combat "V" and gold star. Brigadier General Smith is married to the former Barbara Ann Thomas of Washington, D.C. They have three children. Brigadier General Smith passed away on 6 March 2005.